I have been on a whole food journey for a couple of years now but I still find I struggle when I reach the 3pm slump (this is a real thing, I swear!). No matter how well I have eaten that day, or what I have been doing, it gets to 3pm and I just feel bleh. I still instinctively reach for a coffee and something sugary as a pick me up. Normally I would never post a recipe for a smoothie given that I never follow smoothie recipes myself. 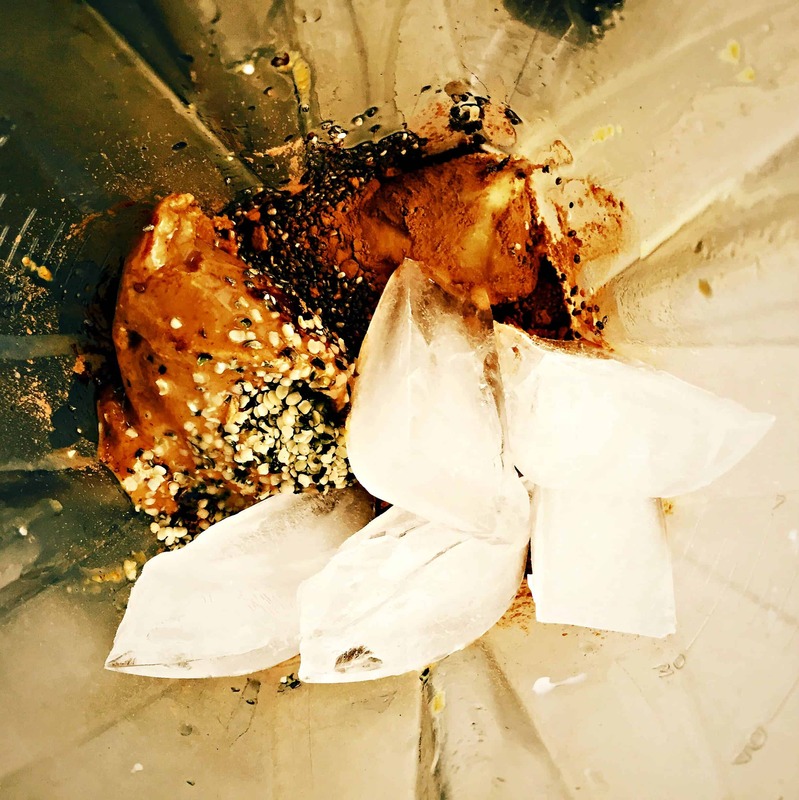 I usually just dump whatever I have at hand into the blender and hope for the best. But this Chocolate Peanut Butter Cup Smoothie is a little bit different and I feel the need to share. I recently concocted this little smoothie in an attempt to curb my cravings on the really bad days, and I have to say, it is really working for me. It is filling enough to get me through the afternoon without wanting to snack on everything in sight, and it is sweet enough to calm down my sweet tooth. Plus, it’s a dump everything in the blender and you are done type job, always my favourite! Double bonus: if you have any leftovers mix them with some oats that night with some extra almond milk and then pop in the fridge. The next day you will have a great Chocolate Peanut Butter Cup Smoothie Oat Bowl without any effort on your part. 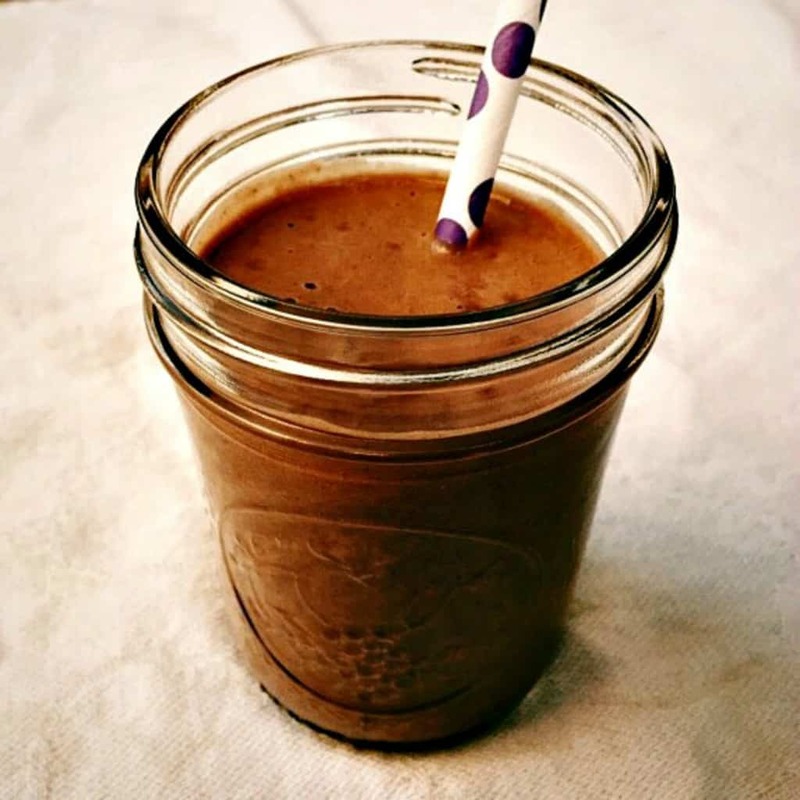 Enjoy a Chocolate Peanut Butter Cup Smoothie when the afternoon slump hits and you feel the need for a pick me up. All clean and real food ingredients. I use a vitamix so it has no problem breaking everything down. If you don't have a blender as powerful as a vitamix you may need to add some more almond milk and process for a bit longer to get the desired result. Yum! 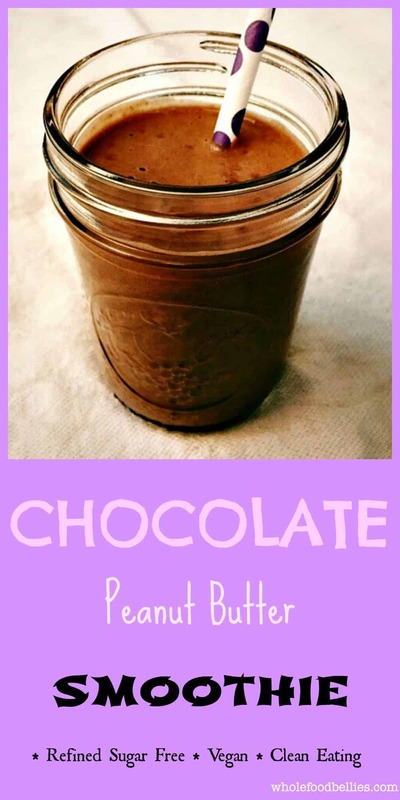 Perfect for a chocolate fix! Yummy! 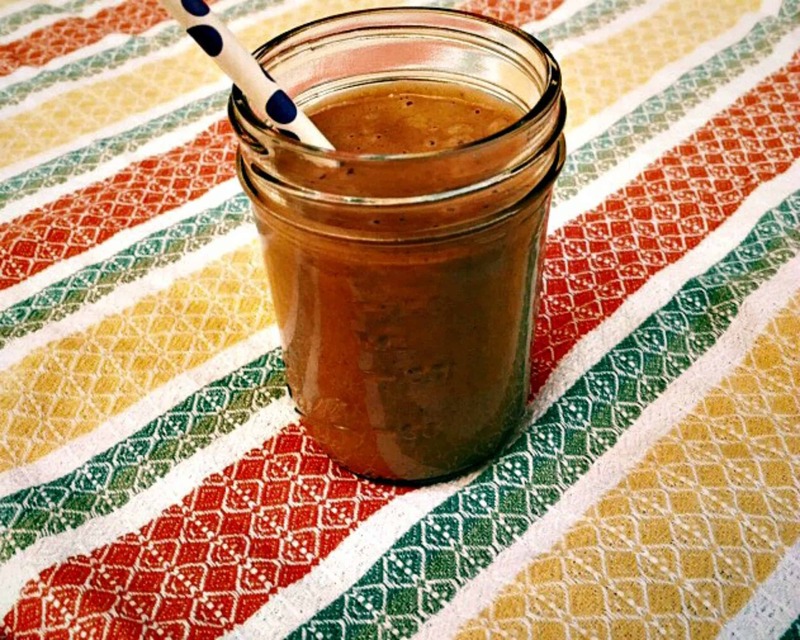 This looks so easy, I’ve never used dates in a smoothie before! They are great for adding a little bit of natural sweetness! I need a Vitamix! Love this recipe! This sounds amazing. That’s exactly what I need. I get that 3pm slump as well and just end up eating whatever I grab first. But I like this alternative. Oh I can totally relate, I have gotten better, but it’s definitely the time of day where I am more likely to make bad choices! I like peanut butter and this would be great for a mid-day snack!!! This sounds delicious! I make something similar, and my kids love it. Anything that combines chocolate and peanut butter is a win in my book! Oh my goodness this looks so good. I think this is what I might make over the weekend for the kids. They will absolutely love it! There are few of ingredienst I don’t familiar with like chia seed and hemp seed, but overal this smoothie sound delicious. Never thought to make peanut butter as smoothie. Chocolate and peanut butter is a great combo. Oh, I actually tried something like this once. It was absolutely divine. Lost the recipe, so thanks for sharing. Happy dance. The smoothie sounds absolutely deli! But my diet wouldn’t allow me to ever drink this! looks so delicious! This is something I would definitely go for breakfast! My husband and I drink a green smoothie every day. Peanut butter and chocolate, 2 of my favorite things. This sounds delicious. We have a green smoothie every day too 🙂 This one is a ‘treat’ smoothie for the weekends! I will be sure to pop over and check out the link! Peanut butter and chocolate are a perfect match. This looks so yummy! I agree – best combo! I just got a new blender and I am all about smoothies right now! I am trying every one I can get my hands on! Hello! Peanut butter and chocolate together?!? I am totally in. This smoothie looks delicious…how on earth am I going to share this with the kids? Haha that is a predicament 🙂 I always give mine a little bit filled up with some extra almond milk – they don’t know the difference. This sounds too good to be true! What a wickedly sinful dish I can’t wait to try and make it for myself and it might help boost my energy levels too. This is my favorite combination in the whole world. This smoothie sounds SO good.